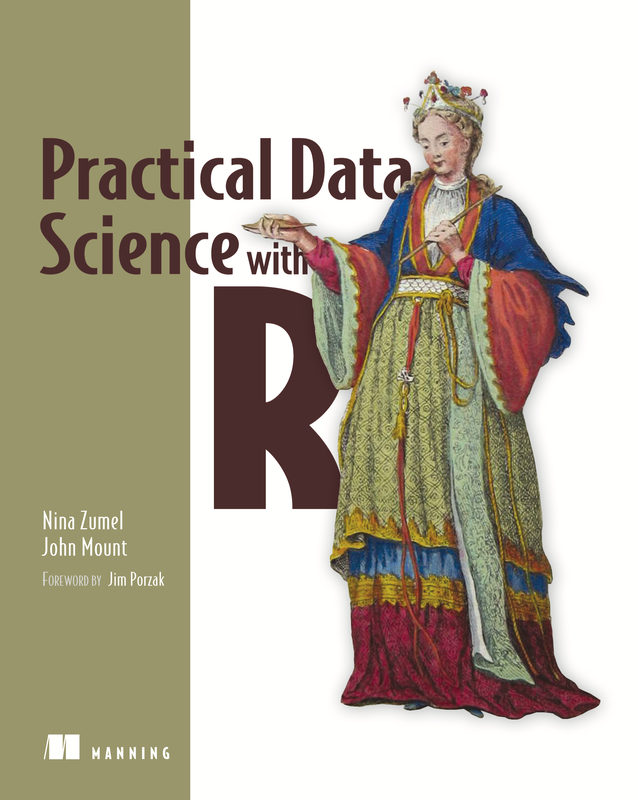 Your authors (Nina Zumel and John Mount) and Manning Publications Co. have all worked very hard to make Practical Data Science with R an excellent and instructive book that is well worth your investment of time and money. However, errors do creep in and we do feel bad about that. To help, we are maintaining a public errata list here (and source). We also have a central site for announcements, example data, and code. If you find any any errors in Practical Data Science with R not listed below, or just find something that you think is not well explained, please post in the book's Online Forum so that they may be collected here for everyone's benefit. Thanks! Start the listing with the line creditdata <- d.
We no longer recommend using H2DB, Java, and Squirrel SQL to load data. Instead we recommend using R, read.table, and dbWriteTable using either PostgreSQL (for a lot of data) or RSQlite (for in-memory practice). Nina has a write-up of the replacement screwdriver concept here. The random forests cross-reference should be to section 9.1.2. We strongly recommend splitting your training set into two pieces, and using one piece for the construction of single variable models, and only the other disjoint portion of the training data for model construction. The issue is any row of data examined during single variable model construction is no longer exchangeable with even test data (let alone future data). Models trained on rows used to build the variable encodings tend to overestimate effect sizes of the sub-models (or treated variables), underestimate degrees of freedom, and get significances wrong. We think the KNN model in this section happened to perform okay due to the aggressive variable pruning heuristic in listing 6.11. A rerun of chapter 6 with the stricter data separation can be found here (including a newer run automating a lot of the steps using the vtreat library; files, of course, are in the course downloads). It is a good idea to harden the look-up vTab[pos,] to vTab[as.character(pos),] to defend against the irregular nature of R's indexing operator (which would fail in this case if we were to have pos as a logical instead of a string). First paragraph: "cross-reference" should be "cross-validation." Second "Run through categorical variables and pick based on a deviance improvement" should read "Run through numerical variables and pick based on a deviance improvement." The "2 times" in listing 6.11 is because statistical deviance is traditionally written as -2*(log(p|model) - log(p|saturatedModel)). We are using a "delta deviance" or improvement of deviance given by -2*(log(p|model) - log(p|saturatedModel)) - (-2*(log(p|nullModel) - log(p|saturatedModel))). We wrote this as 2*log(p|model)-baseRateCheck and it is a deviance style metric (not an AIC style metric as claimed in the text, which got behind the code zip file by one revision). The text above listing 6.11 on page 126 claims we are going to use an AIC-like metric. The original implementation did this by subtracting a variable entropy estimate from each liCheck in the the catVars list and subtracted 1 from each numeric variable (a placeholder). This turned out to not be useful for the data set at hand (this is the sort of thing you do want to try variations of), and evidently we removed it without completely updating the text. Corrected text, listings, and results now here and here . In the text explaining the decision tree "predVar126 < -0.002810871" should read "predVar126 < 0.07366888". Replace "pPosWna <- (naTab/sum(naTab))[pos]" with "pPosWna <- (naTab/sum(naTab))[as.character(pos)]" to get around bad indexing issues due to R's treatment of logical types and expansion of vector lengths. Page 148, Are there systematic errors? Our description of "heteroscedasticity" is wrong and (unintentionally) conflates a number of different negative issues. Our intent was to expand on a simple definition such as "In statistics, a collection of random variables is heteroscedastic if there are sub-populations that have different variabilities from others" (taken from Wikipedia: Heteroscedasticity). Unfortunately we pushed this too far (roughly saying "it is bad if errors correlate with y's" when we meant to say "it was bad if errors correlate with unobserved ideal y's which don't already have the error term added in", i.e. with functions of the x's). The correct thing to do is state that regression (and in particular the diagnostics of a regression) depends on a number of assumptions about the data. Important properties include (paraphrased from Gelman, Carlin, Stern, Dunson, Vehtari, and Rubin "Bayesian Data Analysis" 3rd edition pp. 369-376) model structure, linearity of expected value of y as a function of the x's, bias of error terms, normality of error terms, independence of observations, and constancy of variance. For more see What are the key assumptions of linear regression?. Also, the frequentest version of regression is commonly said to make no assumptions on the distribution of data or parameters (only on distribution of errors). This is not quite true as even the frequentest analysis depends on independence of observations (which is a fact about x's in addition to y's and errors). And a Bayesian treatment may need to assume some form of priors on one or more of these to get well behaved detailed posterior estimates. We will correct later editions of the book, and hope our error does not overly distract from the important lesson that you must be aware of modeling assumptions. We do note with some amusement how rarely "Bayesian Data Analysis" 3rd edition pp. 369-376 uses the term "heteroscedasticity" even though these are the pages tagged with this term in the index (these authors rightly emphasizing concepts over naming). Normality of errors is desirable, but not necessary for linear regression (see Wikipedia and What are the key assumptions of linear regression?). We had previously said the errors must be normally distributed (and we certainly did not mean to imply the y or x need to be normally distributed). Many of the tests of linear regression, including the tests for coefficient and model significance, are sensitive to model assumptions. It's important to examine graphically or using quantile analysis to determine if the regression model is behaving as expected. Unfortunate typo: the sigmoid function is s(z) = 1/(1+exp(-z)) (not 1/(1+exp(z))). After calling scale() always clear attributes from result with attr(., "scaled:center") = NULL; attr(., "scaled:scale") = NULL otherwise prcomp predict(princ, .) does not always equal the desired projection . %*% princ$rotation. Typo should read "The within sum of squares for a single cluster is the total squared distance ..." (not average). Code is correct. Change "Cosine similarity is a common similarity metric in text analysis. It measures the smallest angle between two vectors (the angle theta between two vectors is assumed to be between 0 and 90 degrees)." to "Cosine similarity is a common similarity metric in text analysis. It measures the smallest angle between two vectors (in our text example we assume non-negative vectors, so the angle theta between two vectors is between 0 and 90 degrees)." intersetMeasure now uses the argument measure= instead of method= (which now crashes). Switching the argument name brings the code up to date. Bug: F1 is the harmonic mean of precision and recall: 2*precision*recall/(precision+recall). See Page 96, Section 5.2.1 "F1" for the correct definition. (Not an error) Another important cross-reference for sqldf is page 327, where we show an option that prevents an R-crash on OSX.